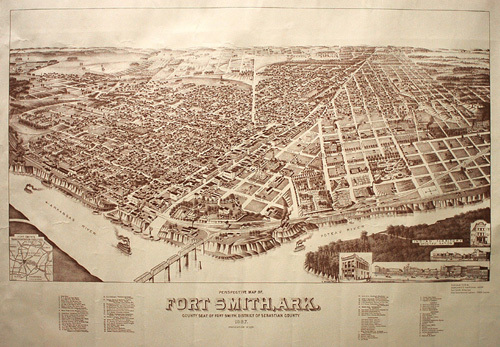 "Perspective Map of Fort Smith, Ark., County Seat of Fort Smith District of Sebastian County, 1887, population 17,500" was first printed in 1887, but scanned here for the Web site from a reprinting done in 1976 for Merchants National Bank to mark the Bicentennial.Only 5,000 copies were reprinted at that time. To see larger, high resolution images of different sections of the map, simple click in the area of the image you would like to examine more closely. Because the enlarged images take up more memory than most other images on this site, a broadband connection is recommended for accessing them. We hope you enjoy exploring the map.